SUNDAY POST ~ Another 'across the pond' post ~ since it is now Sunday 'over there'. My creative spirit has been indulged with a sunny day yesterday and somewhat sunny day today. 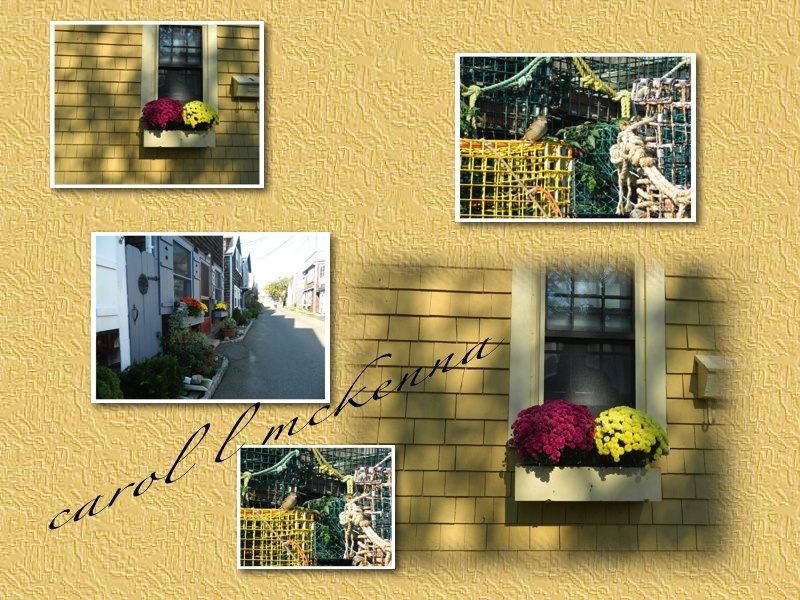 Consequently, the first photo was taken of a friend's door, another was taken of lobster pots with sparrow perched on top of one them and another was a back street on Bearskin Neck with delightful window boxes of mums. The watercolor sketch is for Sunday Sketches. Haiku is Chevre's 'haiku a day', Carpe Diem. I am remembering three very significant women in my life, my Mom, Grandmother and Aunt. They gave me love, taught me respect for all people, animals and things. They broadened my horizons through travel and cultural events. They gave me life. 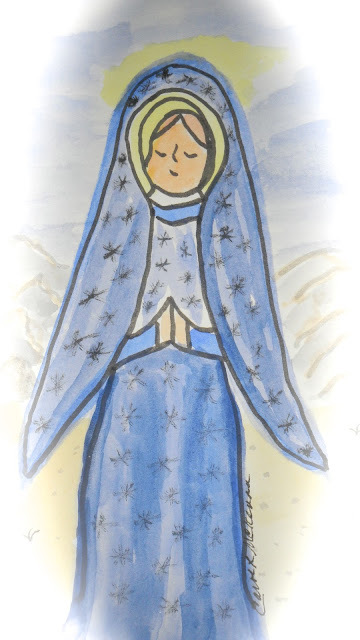 Click on the links above to see wonderful sketches, photography, haiku poetry and words of wisdom and memory. Wishing you a loved filled weekend. 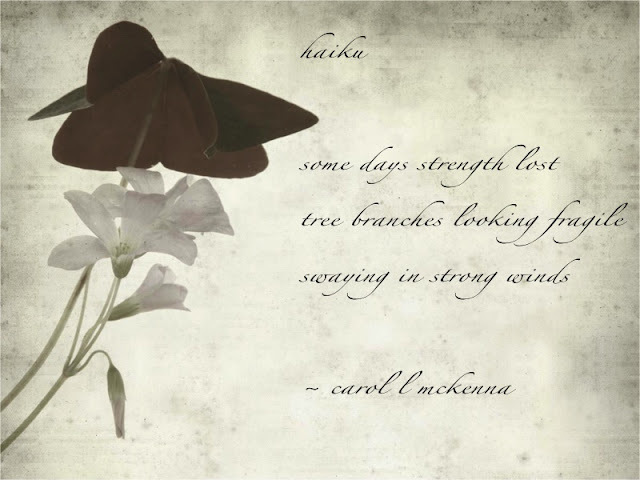 Wow, I love your Haiku and your photos. Great ! Awesome Carol. Very nice haiga. Thx for sharing. It's a gorgeous haiku. Love the photographs. Great post Carol. More lovely Autumn words and the cat painting is so cute! Beautiful post! I especially like the quote for the day. So true, even though it is hard to do. Your photo montage is wonderful & your sketches and haiku are very nice. A beautiful collection of images. Thanks for sharing. There is definitely a child inside you. I always adore your haikus. And the cat is such a cutie! I'd like to hop on over and take a walk through your charming town. I'll be flying over it next Saturday on my way to Texas. xo Jenny. Some days I feel like those fragile branches you describe! i love the cat! also love the photos of new england! makes me hapy - great quote today, too! Hi! Nice captures! I like your photos and a sketch. I like your Haiku very much. Wishing you a wonderful Sunday. great photos... sweet cat! thought provoking post! gorgeous collections this week. the haiku is stunning. 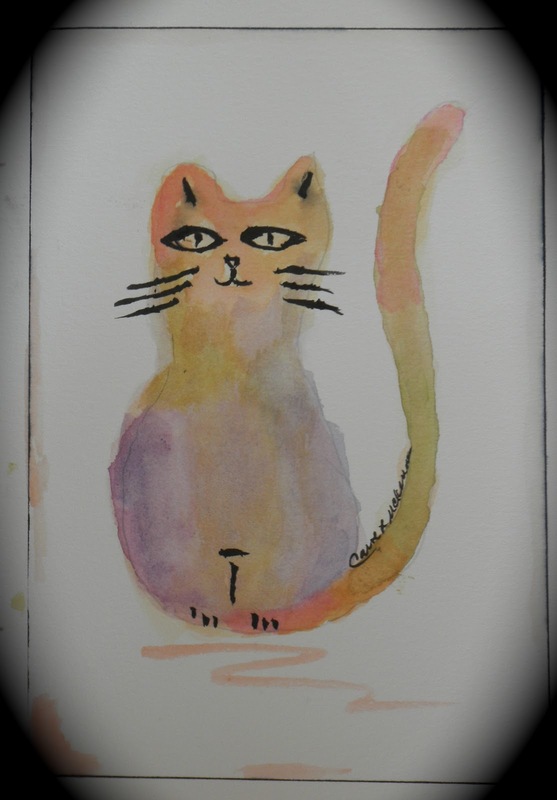 beautiful photos, your cat sketch gave me a giggle and your haiku is fabulous the way you presented it! Love the two window shots in the collage - especially the shadowed one! Cat and Angel are terrific! This is a great way to remember your mom, grandmother and aunt. May your arms be strengthened in seasons of strong winds. I really appreciated your haiku and the painting is wonderful. Have a great Sunday! i love your universal mother with her compassionate heart for all. thank you for honoring your trio of women closest to your heart. i hope you will spin a story or two in the sundays to come and let us experience more fully the ones who remain in your heart with their constant love. A post packed full of fun, imagination and beautiful art! and I too had many strong women in my life...here's to them all! I like your collage Carol, its so sunny and cheerful looking. Your sketches are lovely! Hi Carol!!! lovely new paintings!!! your kitty cat is so cute!!!! Thanks for sharing your beautiful work and words. I love Haiku's and you do them so well. I especially love your kitty, so sweet! Wonderful post and beautiful little paintings! Oh that kitty got my prize today! Mine has been clinging to me since we got home from our trip. Are you visiting in MA or is that where you live? I love it there. I really like the cat! Thanks for sharing at YOur Sunday Best. There is so much lovely inspiration in your blogposts! Such a cute cat and I love your dog muse too!